Articular cartilage is located on the surfaces of the bones in the synovial joint. It protects the underlying bones from damage and shock, but also functions as a lubricant for frictionless movements of the human body. Damage of the articular cartilage can start a slow progressive catabolic process that eventually results in osteoarthritis, a common joint disease affecting people worldwide. Symptoms of osteoarthritis that decrease the quality of life in patients are mainly pain, swelling and/or stiffness due to local inflammatory processes in the joint. Inflammation has a predominant role in inducing pain and can stimulate further cartilage matrix breakdown. Current non-invasive treatments consist of symptom reduction by anti-inflammatory medication, such as the synthetic hormone triamcinolone acetonide (TAA), which is often given locally by intra-articular injections to achieve high concentrations in the joint. A disadvantage of this route is that the anti-inflammatory drug is quickly cleared out of the joint and thus provides only a short beneficial effect. An improved strategy to reduce pain and inflammation is by incorporating the drug in biodegradable microparticles. During the slow breakdown of those particles, small amounts of TAA will be released for an extended period of time, thereby prolonging drug exposure in the joint. In this study, we investigated a novel polyester amide biomaterial platform consisting of amino acids , loaded with TAA. First of all, drug release characteristics were evaluated in vitro where we showed TAA release from the microparticles for over 60 days in PBS. The bioactivity of the release TAA was studied in an inflammatory chondrocyte culture system and demonstrated effective reduction of inflammation by 80-95% over 28 days. Then, the capability of the microparticles to release agents locally in a joint was investigated by loading the microparticles with a fluorescent tracer molecule. Microparticles containing the fluorescent tracer were preserved in the joint up to 70 days after injection, visualized by the tracer in the joint. Furthermore, the potency of the microparticles in reducing inflammation by TAA release was tested in OA rat joints and compared to standard treatment, namely free suspension TAA injection. After intra-articular injection, blood was collected to detect TAA as indication for systemic presence, as this can be a risk for adverse drug effects. TAA was detectable in the blood until seven days and the release of TAA by microparticles lowered systemic exposure. Histological analysis of rat joints showed that joint inflammation was significantly less when injected with TAA-loaded microparticles. Cartilage integrity was not changed. In conclusion, microparticles made from polyester amides are safe in OA rat joints and reduce inflammation after local injection. The microparticles are present up to 70 days in rat joints after injection. TAA-loaded microparticles might therefore provide a good alternative for free suspension TAA injections, since systemic drug exposure is limited, they are longer present and are effective in reducing inflammation in the joint. 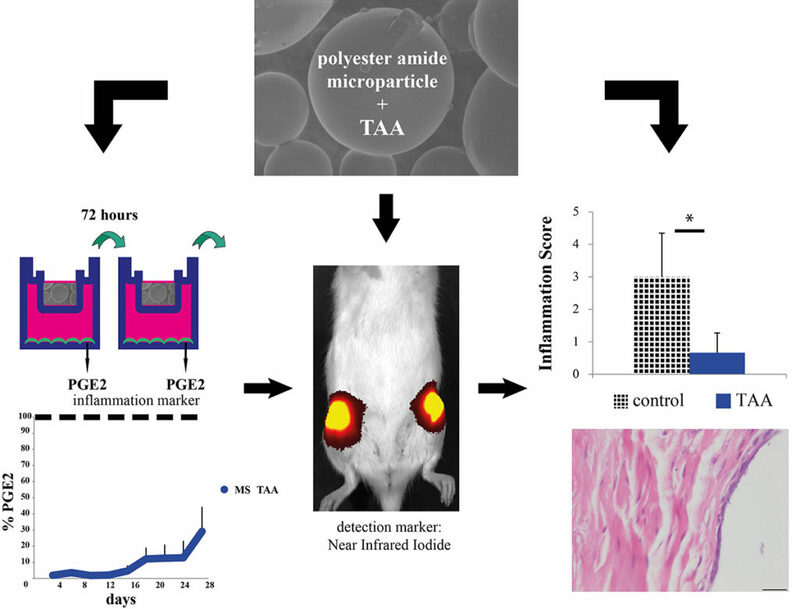 Prolonged inhibition of inflammation in osteoarthritis by triamcinolone acetonide released from a polyester amide microsphere platform.